We appreciate your feedback about your support experience with WooCommerce, developers of Boutique. This helps us maintain high standards on the WooMarketplace, and helps WooCommerce improve. 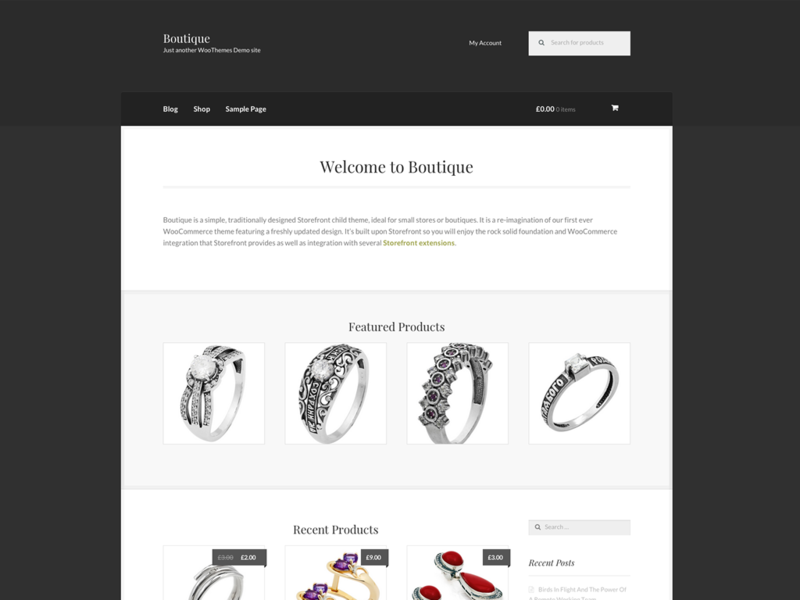 Boutique is a simple, traditionally designed Storefront child theme, ideal for small stores or boutiques. Add your logo, create a unique color scheme and start selling! Boutique is a simple, traditionally designed Storefront child theme, ideal for small stores or boutiques. It is a re-imagination of our first ever WooCommerce theme featuring a freshly updated design. It’s built upon Storefront so you will enjoy the rock solid foundation and WooCommerce integration that Storefront provides as well as integration with several Storefront extensions.